A DANISH do-gooder is stopping off for Christmas in Spain on a three-year charity pilgrimage from Denmark to Tanzania. 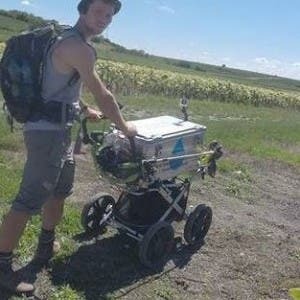 Danish Charlie Uldahl Christensen, 27, is walking 18,000km to fund a new well in a Masai village where he once worked in an orphanage. The ex-soldier passed through Antequera on December 21 and hopes to reach Finca La Sacristia, near Benaque, for Christmas. “The free-spirited people there are taking me in for free as it’s Christmas,” Charlie told the Olive Press.